A quarterback in college, Blanchard had problems with an injured knee as a senior and split time with sophomore Dan Fouts, who would go on to a Hall of Fame career as a pro. He was chosen by the New York Giants in the 12th round of the 1971 NFL draft and caught on as the punter. In three years with the Giants, Jennings punted 169 times for a 41.6-yard average, with a high of 42.7 in 1972. 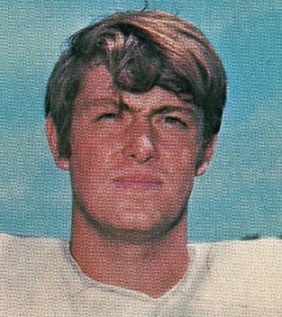 He was beaten out by Dave Jennings in the 1974 preseason, but when the Saints cut P Donnie Gibbs following the first game, Blanchard took his place. Saints went 5-9 to finish third in the NFC West. Blanchard spent another four seasons with the Saints and averaged 41.3 yards on 447 punts. He again led the NFC with a 42.4-yard average in 1977 and proved adept at dropping punts inside the 20. The arrival of kicker Russell Erxleben, a first-round draft choice in 1979, caused the Saints to trade Blanchard to the Tampa Bay Buccaneers, where he remained for the last three years of his career. An injury finished his ’81 season in the third week and he was released afterward. Overall, he averaged 41.3 yards on 819 punts for his career. Blanchard returned to his hometown of Grants Pass, Oregon and coached high school football for 18 years, as well as softball.